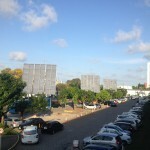 This project funded by the Brazilian oil company Petrobras required the installation of three HCPV systems in a parking lot area in the city of Natal within the facilities of SESI (Serviço Social da Indústria). SESI – A network of private Brazilian institutions and activities nationwide established on July 1, 1946, to promote social welfare, cultural development and the improvement of workers’ quality of life that operates in industries, their families and the community to which they belong. BSQ Solar designed and manufactured three custom made trackers, to host a squared 36 module (10.08kW) array each, and that by having a 4m long extended height pedestal, would allow transit of cars and pedestrians under the collecting surface frame. Three of these systems were installed casting shade on the cars parked underneath. Integration of this solar technology “trees” with the surrounding tall tropical trees results in an attractive combination. One of the reasons why BSQ’s technology got approved was the ability of its proposed tracker, to perform in a subtropical region such as Natal, where noon can happen both to the south and to the north depending on the time of the year. Besides manufacturing and supply, the role of BSQ Solar was to assist local contractor Araxa Solar in the construction and installation. Workers and students in SESI facilities were also trained by BSQ personnel to run the systems and understand their operating principles. Petroleo Brasileiro, SA more commonly known as Petrobras, is a semi-public Brazilian multinational corporation headquartered in Rio de Janeiro. Being oil production its main business, it is the largest company in the Southern Hemisphere by market capitalization and the largest in Latin America measured by 2011 revenues.